Series 26 Collection. 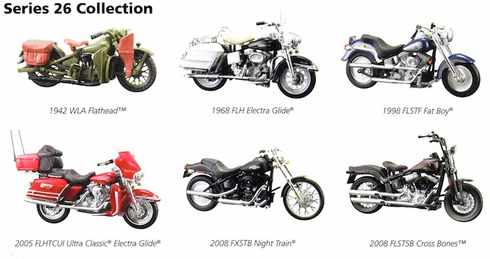 6 Assorted Styles: 1942 WLA Flathead, 1968 FLH Electra Glide, 1998 FLSTF Fat Boy, 2005 FLHTCUI Ultra Classic Electric Glide, 2008 FXSTB Night Train, and 2008 FLSTB Cross Bones. Diecast Metal and Plastic. Price per motorcycle.